kavya is every girl’s courage. Just by knowing her succesful journey a girl could get enough courage to dream towards brighter future. She is very inspirational. She got amazing success and wonderfully leading successful life. Aspiring for further more heights. Her full name is Kavya shree kaila. Age 21 years. qualification BA, LLB. Taekwondo practising since feb, 2017. With this art she had got many achievements. She had high range of world records. Made an achievement 80 single leg strikes in 1min. She is the first person to do this record. 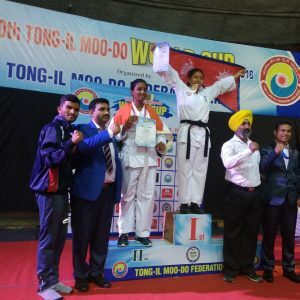 She had Participated in 10th karate(taekwondo) WORLD CUP held at New Delhi on oct31 to Nov 2. And achieved Silver medal for India. First girl from South India to get this achievement. Received high range world records from roshaiah garu. 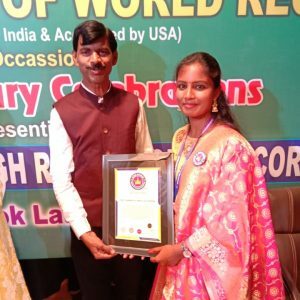 Received high range world records from her guru TAEKWONDO GRAND MASTER M.JAYANTH REDDY(also brand ambassador of high range world records). Received high range world records from my guru Moin uddin. She is going to participate in Hyderabad national taekwondo championship on 3rd February. She is going to participate in university sports for taekwondo. “An art is the best cure to any kind of trauma” is her mantra. In this way she is enjoying the taekwondo art. She is saying that.. “an art is the best cure to any kind of trauma”. My main aim and dream is to bring awareness regarding the acient worth more martial art among the people which enhances the individual’s self defense and even their health. Many girls are getting inspiration from kavya. 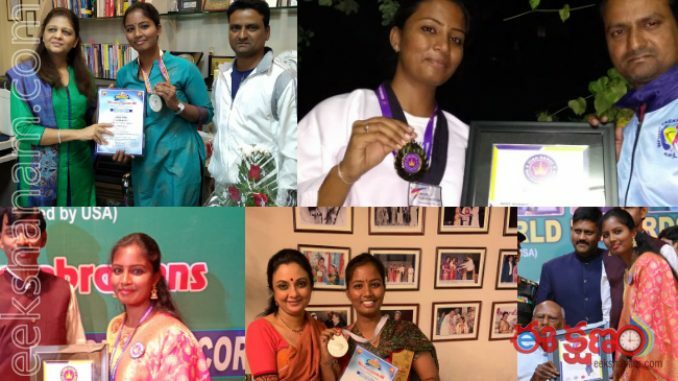 By seeing her taekwondo success many girls getting motivation and are following her to learn taekwondo. 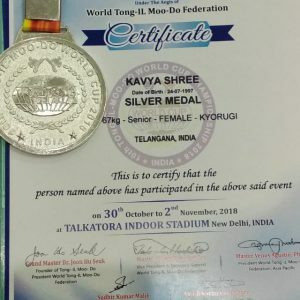 Actually kavya also enjoying and very happy for girls getting motivation and preparing themselves to learn taekwondo. Kavya is every girl’s courage. Kavya is saying that there is no age limit to learn arts. She is also saying that an art like taekwondo which has been fading out should become as a beautiful ornament to girl. She is wishing a change in girl’s life with taekwondo. This is her concept, intention, desire. A trip in 2017 initiated my first stage. In winter season we were going to places. When I stepped in the train compartment I knew every relationship in my life would undergo transformation but didn’t realize the extent of it. I met people and interacted wi th them truly. Watched beyond superficial layers. I saw beauty in the people which I didn’t see before. It still feels like a dream even today. I was unlearning things which I was taught. The entire trip left me exploring people I thought I knew and more i mportantly me. I felt like a tree in autumn season shedding leaves embracing winter. Middle stage, It was contemplating, and purifying period of my life. I decided to move out of home. It wasn’t easy financially, emotionally, and much more. I did it anyway , that was my best decision so far. Seasons changed, and it was spring of new year. I was tagging along with my friend as her morning company to her Taekwondo classes in park. I wanted to enjoy morning sunshine, and run a little. I used to sit there whil e she practiced, and my curiosity grew. I used to ask Master Moin Uddin a lot of questions, and this amazing man used to encourage me to learn basics like how to do kicks which soon escalated. By middle of March I was a regular student there. It was relear ning period of my life, springtime. I am learning new things every day, and it is never ending process. In September I got recognition from / made it to High Range Book Of Records for making 80 single leg strikes under one minute. 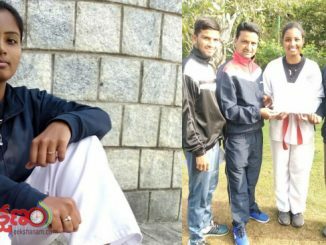 And in Novembe got silver medal in Karate World Cup (Taekwondo). My friend and I participated in Guinness world records, 1300 Knee strikes under an hour, we are awaiting results , and also waiting for Osmania University sports games. Shikha Goel Madam, IPS officer, app reciated us when she came to know about our achievements and efforts. I feel that Medals, and records are great for having goals. Also for recognition. I never wanted fame nor expected any. I wanted recognition so that people wouldn’t think it is impossibl e and find it inspirational to start r their own journey. I had health problems, and felt directionless in past. Dance and marital arts have rejuvenated and revivified me. I am helping few people today deal with what I have dealt, and hope to help more peopl e. Thus last stage of my rites of passage happened, and new journey began. Art is best cure to any kind of trauma. RK Roja as AP Home Minister? Can India win the T20 series against England?